A proposed amendment to the Alabama Cultural Resources Act may give relic-hunters easier access to artifacts lying beneath the surface of the state’s rivers, lakes, and bays. In Montgomery, Alabama Senator Cam Ward has introduced a bill to amend the Act, currently requiring underwater explorers to obtain a permit from the Alabama Historical Commission before diving in search of underwater artifacts. The amendment would still require permits to recover pieces related to shipwrecks and would forbid disturbing Native American burial sites, but treasure hunters would otherwise be free to search state waters and keep what they find. Opinions surrounding this issue are sharply divided. On one side is Steve Phillips—advocate for the amendment and owner of Southern Skin Divers Supply Company of Birmingham. 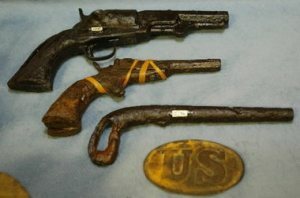 In 2003, Phillips was arrested for an underwater expedition on which he found a civil war era rifle, though he was only convicted of a misdemeanor. Phillips argues that there are no professional archaeological expeditions being conducted and without amateur collectors, many artifacts would still be at the bottom of Alabama waters. On the other side is Teresa Paglione, president of the Alabama Archaeological Society. She argues that without legal protection, artifacts from the Civil War, settlement of the state, the age of European exploration, and thousands of years of Native American history could be carelessly removed in such a way as to prevent proper historical study. The context in which these objects are found is as crucial as examining the objects themselves; provenance cannot be ascertained once the objects have been extracted from their resting places. Another fear is that removing restrictions would lead to raids on historic sites for private collections, depriving Alabama citizenry of its cultural heritage. The debate will continue as the amendment to the Act is considered.